Tons of Washington Republicans hate Trump, but none have the courage to stand up to him. Many in Washington are shocked and appalled by Donald Trump’s presidency, but none have the courage to say so. 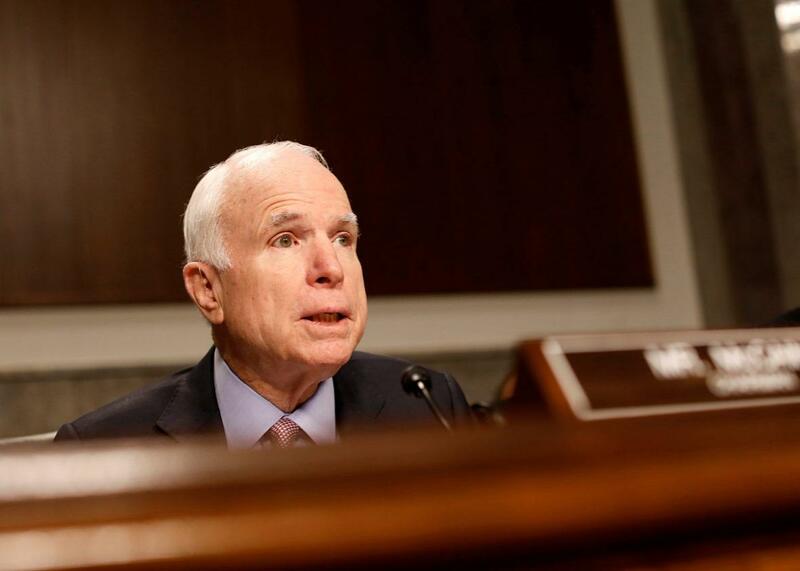 Committee chairman Sen. John McCain asks a question during a Senate Armed Services Committee hearing on Capitol Hill in Washington on March 14. Before Trump’s election, I thought I had a low opinion of Republican members of Congress. Yet it turns out I had much more faith in them than I realized, because I’ve been stupefied by their passivity in the face of Trump’s corruption and incompetence. Sure, Republicans are eager for massive tax cuts, the end of Roe v. Wade, and the opportunity to exploit natural resources without oversight from environmental regulators. But I’d assumed that they also valued America’s putative leadership in world affairs, and I couldn’t imagine that they’d accept even the possibility of Vladimir Putin manipulating our democracy. Shouldn’t we be able to count on jingoist pride from politicians who’ve spent decades beating their chests about patriotism? As cliché as it sounds, I have continually wondered through the first two months of this administration: Have they no shame? With only a few exceptions, Republicans are attempting to shield Trump from investigations into his campaign’s Russia ties and allowing him to nakedly profit from the presidency. Devin Nunes, Republican chairman of the House Intelligence Committee, compromised himself and the House investigation into Trump’s Russian entanglements by improperly sharing information with the White House. His colleagues tried to derail the investigation by directing attention away from Trump’s possible Russia connections and toward anti-Trump leakers. This week, Nunes abruptly canceled an open hearing. Yet even as Nunes’ credibility has evaporated, House Speaker Paul Ryan refuses to remove him from his post. As of Tuesday, it would appear that only one Republican congressman, the iconoclastic Walter Jones, has said Nunes should recuse himself. Meanwhile, flagrant violations of American laws and norms go unchecked. Few in government are even trying to police Trump’s manifold financial conflicts of interest. The president is blatantly selling access to himself by doubling membership fees at his private club, Mar-a-Lago. And as Politico reported, the club doesn’t keep visitor logs, meaning there’s no way to track whom Trump and his relatives are meeting with. Presidential daughter Ivanka Trump is assuming an ethically dubious semigovernmental position; in meetings with foreign leaders she plays a larger role than our elusive secretary of state. “Right now the American political system is increasingly looking like a dystopic third-world banana republic, and the Republican Party is complicit in allowing this to happen,” says Jerry Taylor, president of the Niskanen Center, a libertarian think tank. At first glance, this seems odd. Trump is not popular; a recent Gallup poll has his approval already at 36 percent, below Obama’s lowest-ever rating and well below where Obama was at a similar point in his presidency. The example of Sen. John McCain shows us that any Republican willing to demonstrate even nominal independence from Trump can expect a fulsome media tongue-bath. It’s true that good mainstream press may count for little for the vast majority of the Republican caucus, but it would surely mean something in one of the 23 GOP House districts that went for Hillary Clinton in the presidential election. Earlier this month, Saturday Night Live featured a faux movie trailer about a heroic Republican patriot “who put country over party” and “stood up for his nation’s founding values.” The joke was that the hero’s name was TBD—to be determined. At the heart of the sketch was a truth: There’s a huge opening for a Republican renegade in Washington, and whoever steps up to fill it can expect a degree of glory. So why isn’t anyone stepping up? Republicans were able to defy Trump on the American Health Care Act; the president’s petulant tweets about the Freedom Caucus—the right-wing faction that helped torpedo the bill—don’t appear to have hurt the group’s members. Yet the AHCA was unique in engendering public revulsion across the ideological spectrum; a Quinnipiac University poll found that only 17 percent of respondents approved of the bill. “With the health care bill, there was enough political cover wherever you fell on it,” says Bardella. Opinions on Trump and Russia are far more polarized. A March CNN/ORC poll found that most Republicans don’t believe that Russia tried to influence the election. Fifty-four percent of Republicans said they were “not at all concerned” about “reports that people associated with Donald Trump’s campaign had contact with suspected Russian operatives.” (Only 7 percent of Republicans were “very concerned.”) Thus Republicans who might side against Trump on the emerging Russia scandal would face a seemingly hostile electorate, an especially hostile president, and the possibility of a primary challenge.